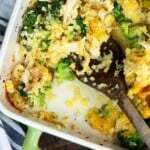 This cheesy chicken casserole is full of cauliflower rice, broccoli, and shredded chicken. Such a simple weeknight meal. Fry the bacon until crisp and crumble it into small pieces. Add the steamed cauliflower rice and broccoli to a large bowl with the chicken, bacon, eggs, 2 1/2 cups cheddar, and spices. Stir well to combine.